Are you thinking ahead to warm weather, sunshine, and splash pads? Summer is right around the corner, and we often get questions about the best carriers for warm weather and water babywearing. We’ll tackle these two topics separately in a two-part summer babywearing series. This first post focuses on babywearing in the heat. ​​​One of the most common questions people have about summer babywearing is which carrier is “best” for the heat. This is a hard question to answer because it really depends on what type of carrier you normally prefer, and unfortunately there is no single “best” carrier for every family. People often ask which type of wrap is best for hot weather. Natasha Sullivan (VBE) explains “this is all really personal preference. It’s like asking what pair of jeans will suit you best. For summer, linen and cotton blends breathe the most.” The Natibaby Wine Flowerelli wrap in our weekday library (d)* is a linen-blend, whereas the Fidella Outer Space Lilac (d) and the Hoppediz Peacock (e) are both thin all-cotton options that could work well for warm weather. However, it’s not necessary to buy a different wrap just for summer. Cynthia Bachhuber (VBE) points out you might just try a different type of carry for warm weather. “For me, more than the fiber blend of the wrap, I find that the thickness of the material and the number of passes over baby and me are what really trap in heat. I’ll take a single-pass carry in mid-weight cotton over three passes in linen.” So, what are some good warm weather, single-pass carries to try with your current wrap? Ashley Taylor (VBE) says “ruck tied at shoulder with a candy cane chest belt was definitely my go to.” She also suggests “towel torso carry–because that means we were swimming!” 🙂 The traditional sling carry is another single-pass carry to try, which can be pre-tied and is great for popping baby (or a busy toddler) in and out of the wrap as you need. In a woven wrap, the reinforcing passes can also often be bunched instead of spread, so that you create the feel of a single-pass carry using the ones you’re already familiar with, like front wrap cross carry. However, this is not an option with a stretchy wrap, like the Moby or Boba Wrap, because the knit-jersey fabric is not strong enough in a single pass to safely support baby, so the reinforcing passes should always be spread. (Stretchy wraps also cannot be used for back carries.) However, if you like the feel of a stretchy wrap, but want the option of single-pass and back carries, a hybrid wrap like the Wrapsody Stretch Hybrid (e) is specially woven to offer that additional support while still being stretchy, lightweight, and thin. But what if you’re not a wrapper? Ring slings and Asian inspired carriers can also offer the same flexibility and breathability of single-pass carries, which make them excellent summer babywearing options. Carrie Johnson Torres (Volunteer) says “single layer linen ring slings are nice in warm weather.” Coral Conant Gilles (VBE) agrees: “This is my recommendation too. Cotton is good, also, and can be easier to find.” Our Lending Library includes a number of linen ring slings, like the Sleeping Baby Productions linen ring slings (available in both the weekday and weekend libraries) and the Wildbird ring sling (e). The Sleeping Baby Productions French twill (d) and the Soul Slings (e) single layer cotton ring slings are also breathable options. ​Asian inspired carriers, like meh dais and onbuhimos, are also great options. Lachele Greenlee (VBE) says “I love the onbuhimo for warm weather!” Onbuhimos do not have a waistband, so there’s less material tied or buckled onto the wearer. Our Lending Library includes a Soul Slings Onbuhimo (e) and a 2Lambie Onbuhimo (d). Meh dais are also great because of the flexibility they offer. BWI of O’ahu (where they enjoy “summer babywearing” for a good portion of the year) suggests trying a hip carry, because it “provides more airflow for both caregiver and baby!” If you haven’t used an Asian inspired carrier, you should definitely stop by a meeting to try out these versatile babywearing options! ​So, do we recommend skipping the babywearing in the summer then? Not at all! There are still ways to make babywearing comfortable (and safe) even in hot weather. 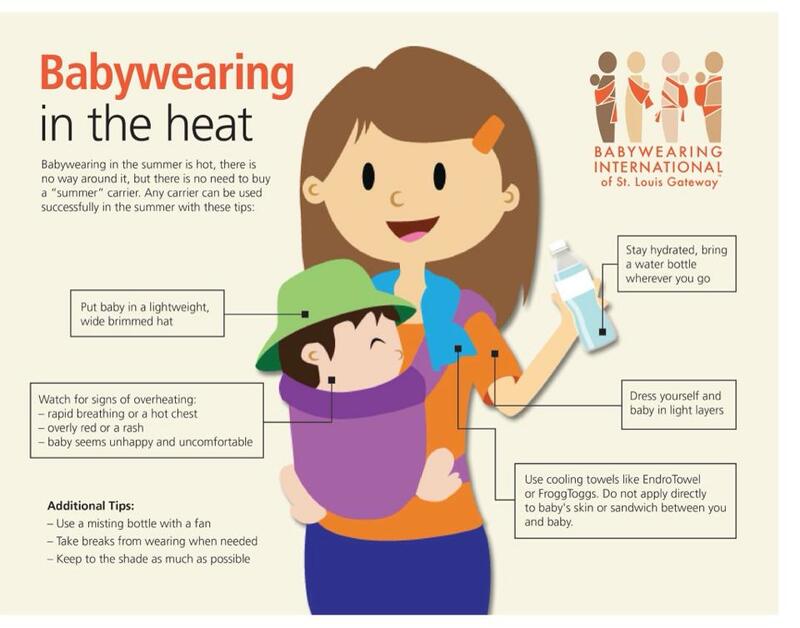 BWI of St. Louis Gateway designed a wonderful infographic with tips for babywearing in the heat. Ultimately, it’s important to know that it’s not necessary to buy a new carrier just for warm weather babywearing. But if you’re in the market for a new carrier, this page lists some of the options available. We have some of these in our lending library, as well as the great warm weather standouts mentioned above, so plan to stop by a meeting this summer to check out one of these wonderful warm weather babywearing options. *Note: The letters next to carriers denote whether the carrier can be found in the Weekday (d) or Weekend (e) Library. ​In Part Two of our Summer Babywearing Series, we’ll discuss water carriers, so stay tuned for more tips to beat the heat! BWI-Madison is now ​Madison Babywearing!